The race through 2016’s books continues! My name is Amanda and I am a Grey’s Anatomy addict. Have been since season 2. Shonda Rhimes is my Beyonce, the superstar goddess of my dreams who I could only dream of becoming. (According to this book, Beyonce is Shonda Rhimes’ Beyonce, which made Chris ask, “Then who is Beyonce’s Beyonce?”) So being able to sit down at take hundreds of pages of advice from her was the summer read of my dreams. Not only was there a lot of good writing advice, there was a lot of good advice for general writerly types–i.e., we who would rather snuggle down at home with figments of our imaginations rather than do most other things. The basis for the book is exactly what it says on the cover: for a year, Shonda Rhimes made it her goal to say yes to everything after a lifetime of anti-social writerliness. Granted, what Shonda Rhimes gets to say yes to are awards shows and guest spots on The Mindy Project, but it was still a year’s worth of great advice for anyone about being your own person. When we last left Jalan and Snorri, they were literally going to Hell. The Wheel of Osheim takes off at almost whiplash speed at another place entirely. The first two-thirds of this book were not at all what I was expecting–and not always in that usually brilliant Mark Lawrence way. Weirdly, some of the most action-packed and most dire scenes were, dare I say, boring? Even though there were zombies and fighting and riding through Roman-esque streets at breakneck speed, they struggled to hold my attention. But then, as momentum started building for the end of The Red Queen’s War, the story got back to being its brilliant self, and still had many awesome twists in store. There was a point in this last chunk that I had an unpleasant shiver–I remembered reading Emperor of Thorns, and the moment when I knew that it could only end with Jorg dying. I really, really didn’t want Jalan to die. I was filled with dread every time I turned the page–that’s the power of Lawrence’s story-telling. Hope is often a stupid thing to have in the Broken Empire, and I was prepared for the worst. At the end of his second epic series, Lawrence did not disappoint. Ladies and gentlemen, I give you my Halloween read of 2016. This was my mom’s choice of one of the scariest books she’s ever read, so with that delightful knowledge in mind, I dove into The Exorcist. I remembered surprisingly little about the movie (which I probably repressed because I do remember covering my eyes a lot), so the book was still full of surprises. The first and foremost being that the prologue of The Exorcist is possibly the most melancholy passage ever committed to paper. For all the shocking and violent moments within The Exorcist, I think what it did best for me was create this constant tone of dread and anxiety. 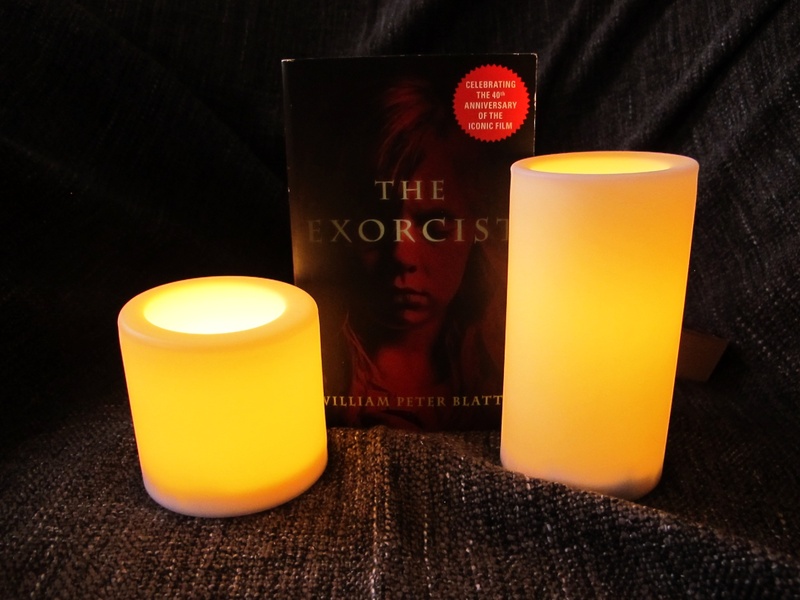 Unlike most other exorcism fiction (film and prose) that has been created since, The Exorcist does not rely on the most horrifying moments to carry the rest of the story. There’s a lot of intelligent contemplation and conversation about guilt, about religion, about losing faith, about history… It was the bleakness, not the horror that struck me hardest. Did that spare me from having nightmares about it? No, it did not. I was going through my own stacks looking for something that would be a soothing palate cleanser to The Exorcist, and I was delighted to find The Slow Regard of Silent Things calling to me. I’ve owned it for a long time but had never found the right time to read it. I love Auri in The Kingkiller Chronicles, and The Slow Regard of Silent Things can only make you fall in love with her more. It did not take long before Auri’s affection for her belongings rubbed off on me. When Foxen (her lantern) was dropped quite early on, my heart sank, so the tone and my sympathy (no pun intended) for Auri was set to enjoy the rest of the novella. The Slow Regard of Silent Things, among all its other qualities, is an impressive exercise in world-building, because it’s a world as seen through a very particular psyche. It’s The Underthing as Auri knows it, and she knows it very well. It’s lovely and fantastical and magical and terrifying. The Slow Regard of Silent Things is one of those pieces that every writer has tucked among their drafts–something that they wrote just for themselves that may or may not ever see the light of day. I’m glad that this weird little story made its way out of The Underthing. It came in under the wire, but Ghostland was my favourite read of the year and one of the most interesting books I’ve ever read. It’s a very particular kind of interesting: it’s not only about haunted places and their ghosts, but also about what may truly be behind the shivering feeling people get when they look at the past. Though I don’t particularly believe in ghosts, ghost stories always strike me pretty hard, so following that fear down the rabbit hole of history and culture and humanity was an amazing exercise for me. These brilliantly written and explored essays about what famous ghosts might really say about our guilt, regret, anger, etc. were like nothing I’ve ever studied. In fact, my biggest wish on finishing Ghostland (which I consumed mostly in one day, hunkered down in my reading chair) was that a Canadian equivalent existed. The medium of ghost stories was certainly one of the most fascinating ways to look at the local history of all these American places, and I would love to take a similar tour of the history of Canada. Please, ghost story wish fairy, make it come true.